southern orders : CANON LAW: "CANONICALLY, BEING BAPTIZED CATHOLIC MAKES YOU CATHOLIC WHETHER OR NOT YOU EVER ATTEND MASS AGAIN, PERIOD!" CANON LAW: "CANONICALLY, BEING BAPTIZED CATHOLIC MAKES YOU CATHOLIC WHETHER OR NOT YOU EVER ATTEND MASS AGAIN, PERIOD!" The Catholic Church has never been an elite country club. 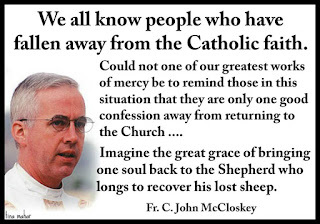 But some of the theology of post-Vatican II parishes make Catholics who simply want to come to Mass on Sunday and go to Confession once a year and receive Holy Communion once a year during the Easter Season, feel guilty and unwelcome if they don't participate to the hilt. While the theology of Catholic Stewardship has engaged Catholics who want to be engaged, have we made those Catholics who want to be on the periphery of Church feel as though they are second class citizens in their parishes? Is this what causes them to be absent when otherwise they might at least attend Mass and sit at the back and not want to be bothered by anything else? * 68 percent cited “having a personal relationship with Jesus Christ” as essential. * 67 percent: Belief in Jesus’ actual resurrection from the dead. * 62 percent: Working to help the poor and needy. * 54 percent: Devotion to Mary as the virgin Mother of God. * 54 percent: Receiving the sacraments. * 42 percent: Being part of a Catholic parish. * 41 percent: Being open to having children. * 34 percent: Celebrating feast days or festivals that are part of your national or ethnic heritage. * 33 percent: Opposing abortion. * 29 percent: Working to address climate change. The survey, conducted May 5 to June 7, 2015, has a margin of error of plus or minus 3.5 percentage points. Wrap in many more who consider these beliefs and actions “important but not essential” and the survey shows that 2 in 3 Catholics take every one of those markers seriously. Pew also found that 9 percent of Americans consider themselves ex-Catholics — but [CARA researcher Mary] Gautier would claim those people as Catholic too. Pope Francis has taken on a new model of being pope that has been disconcerting to those who appreciated Pope Benedict's model and restoration of papal grandeur. I suspect Pope Francis believed the more aloof approach of Pope Benedict in terms of the trappings of the papacy he recovered distanced the papacy and the Church from disaffected or alientated Catholics or those who have tuned out and turned off the Church given our world's trends in style to be very casual, a tee shirt culture! Europe has become so secular that the pope is trying to reach those who have tuned out and turned off. He's gotten their attention and this alarms many who haven't tuned out or turned off and think maybe His Holiness is selling out. I don't think Pope Francis is selling out, he wants the Church to be the dragnet of Jesus' parable and then let Jesus' do the sorting at our personal judgement or general judgement. As a seminarian of the 1970's though, I do think at times Pope Francis is resorting to the failed practices of the 1970's and what he does is a type of nostalgia for me that is not heart warming but leaves an empty pit or a twisted knot in my stomach. But we have to be cognizant of the following that I've said before that the Church prior to Vatican II had 90% of Catholic attending Mass every Sunday, but many of them were merely cultural Catholics doing the minimal, which meant coming to Mass weekly and going to Confession once a year and receiving Holy Communion once a year during Easter (the Easter Duty). We need to have cultural Catholics again mixed in with the more fervent! Perhaps this is Pope Francis plan for the new evangelization. Get people in the pews no matter how converted or not they are. While the theology of Catholic Stewardship has engaged Catholics who want to be engaged, have we made those Catholics who want to be on the periphery of Church feel as though they are second class citizens in their parishes? This will sound cynical, but we are aghast at the impermanance of conversion, yet that would contradict what may be the single greatest gift from God: our free minds. People walked with Christ and saw his miracles and were converted for a time. But when He told them they must use their free will to follow him to the Cross many, most, left Him. And they had actually been present for the miracles. Finally, think of all the people who touched Him, the hem of His garment, and how few of them were healed. This is sad, this is cause for lamentation rising to the halls of Heaven itself; but it is no surprise. Could you point to the particular canon(s) which state most clearly your point about baptism? I can't speak to the issue canonically, but doctrinally, according to Mystici Corporis, Catholics (or, technically, "members of the Church") are those who 1) have been baptized AND profess the True Faith, AND 2) participate in the Communion of the Church, i.e. who haven't excommunicated themselves by their own unhappy act or been excommunicated by competent authority. In other words, one must practice the Faith to be of the Faith. 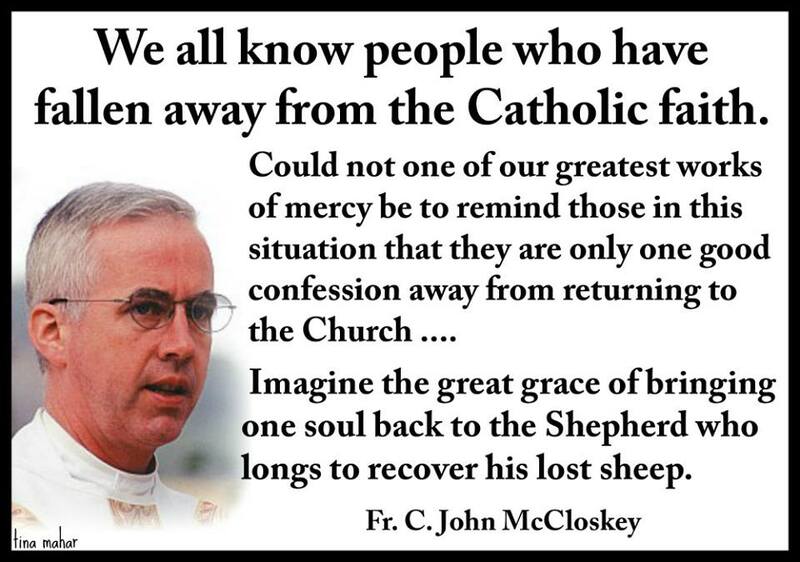 What really gets my goat is the presumption on the part of some modernists that the reign of JP2 was a failure because look at all the Catholics who continued to abandon the practice of the faith! Oblivious to the fact that it wasn't JP2 who ran their parishes and dioceses and religious orders but them, these modernists who did everything they could to water down or ignore his magisterium. I for one recall the bruhahah over the rollout of the Catechism of the Catholic Church - the hand wringing, the American Catholic Church, the parallel magisterium, the pundits and "theologians" who gushed how terrible it was to have a compendium and how it was impossible to just give it 'raw' to people - no no no, it HAD to be "mediated" and properly "presented" in a "relevant" form to the little people. Very gnostic, very elitist and very much telegraphing that they disdained the Faith and so felt as though the Pope was outflanking their strangle hold on catechesis. But thanks to the CCC every Catholic adult in the pew could spot error in the countless books distributed in our seminaries, our schools and our parishes. Thanks to the CCC we could refute high and mighty (but curiously debate shy "theologians") on the merits. Sure they could write books about Jesus or the doctrne of the faith but if any thesis contradicted the CCC we could simply dismiss them. Then the World Youth Days came - and again, the youth flocked to hear the Pope speak directly to us - outflanking the theologians and modernists who were STUNNED to see the hundreds of thousands of eager youth flocking to the Pope - utterly rejecting the sexual and socialist revolutions that they enjoyed in their youth. So here we are....Catholic adults with our families who have the CCC and personal experience in the WYD with St. John Paul II as the Pope we know....and we're just not impressed with anything less than that. We know the score. We know that it wasn't JP2's fault that so much rot continued. We realized that it was a generational thing. I sense that with Pope Francis there is an "empire strikes back" thing going on -a Battle of the Bulge counter-offensive being launched from the last reserves of the modernists before age times them out of the scene. 10 years from now the LCWR will largely cease to exist. Nuns on the Bus will be in wheel chairs. The cardinals and bishops who yearn to see further sexual and socialist revolutions will be gone to their eternal reward or be beyond voting age or in retirement. I expect 2025 to arrive in a post-world war changed landscape. I wonder if I will be around to greet the new year. But I've no doubt that the Church will be largely in the hands of bishops and priests and religious sisters and active laity who cut their teeth on St. John Paul II, the Pro-life movement, and WYD global solidarity. HAS THIS EVER HAPPENED TO YOU AT MASS? WELL THIS IS LITURGICALLY EMBARASSING! WHO IS BEING THE LEFTIST BOOR HERE? WHEN DOES ONE GET SICK ABOUT THE WASTE OF MONEY? LIBERAL GERMAN CHURCH A COMPLETE DISASTER! AND THE ANTI-CATHOLIC BEAT GOES ON!